My project concerns the development of new semiconductor based lasers with the characteristics and performances required by the academia world, both involved in the ColOpt project or not. The laser is probably the most important invention of this century and it is applied in many fields, including Cold Atom physics. It is so important because it enables a very special and unique way to interact with matter. The improvement and development of this devices will allow researchers to study new light-matter interaction regimes, going beyond the known Quantum Optics and state-of-the-art Nanotechnology. My goal is to enhance the usability of the ECDLs by increasing their reliability and stability. We will do this by reducing the background of amplified spontaneous emission due to the amplification process, while still having a narrow linewidth. Possibly, a reduction in costs, will allow further spreading of these very special devices in industry and academia. I’ll develop the project in TOPTICA Photonics AG (DE), the top scientific lasers company in the world. Furthermore, I’ll work partially at the University of Tübingen (DE), where they study cold atoms, using these devices. Contact and research exchange is expected with the University of São Paolo (BR) to the Instituto de Física de São Carlos and with the Department of Physics at the University of Winsconsin (US). This aspect will allow me to build a very broad professional network composed by both the accademia and industry worlds. Thanks to my efforts, the next generation of ECDLs will be a user-friendly, reliable and compact devices. They will be easy-to-use even for non trained personnel and they will be available almost in every wavelength/color in the visible (except from 520nm to 630nm), covering most of the applications that require this extremely pure kind of source, in or out a scientific laboratory. I was born and grew up in Potenza, a quiet and beautiful city in the south of Italy. There I attended middle and high school with strong attitude for all the disciplines that can be defined “Scientific“. In my home Town I even moved the first step in the professional world, learning the secrets and the art of the “Pizza“, in the Pizzeria of my parents, our family business. 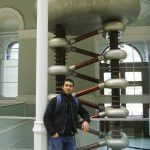 In 2009, after high school, I moved to Pisa where I attended the Bachelor and Master Degrees in Physics specializing myself in Physics of Matter. As final examination for the Master degree, in 2016 I developed the Master Thesis at the Fraunhofer centre for applied photonics (CAP), in Glasgow (UK). Its title is: „Single Frequency 〖LiLuF〗_4:〖Pr〗^(3+) Solid State Laser GaN-Diode Pumped“, supervised by Prof. Tonelli Mauro. In 2017, currently, I’m a PhD student on the ColOpt network based at TOPTICA Photonics AG (München, DE). My hobbies are sport (fitness, football), movies, music and all kind of social activities. Furthermore I’m a blood and organ donor.